Ever walk by a restaurant that looks interesting but dismiss it out of hand because you assume they don't have gluten-free options? I did. 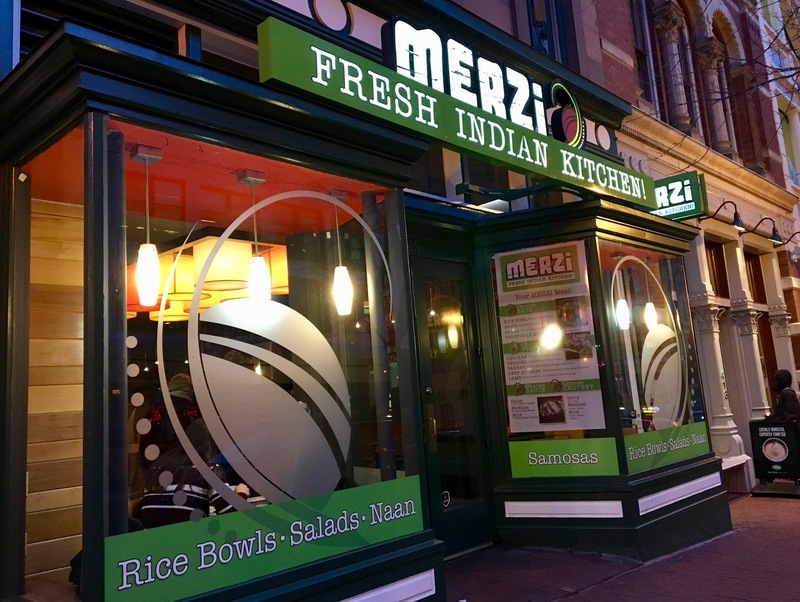 Working in the Penn Quarter neighborhood, the brightly colored storefront of Merzi Fresh Indian Kitchen caught my eye every time I came and went from work. With no menu markings, I assumed (incorrectly as I discovered) that nothing was safe. However, when looking for a place to grab dinner with my mom in town, I decided to reach out to Merzi over Twitter to see for sure whether there was anything there for me. Sure enough, a friendly staff member assured me that they had a wide selection of gluten and dairy-free menu items. I needed no further convincing to check them out that night. According to Rickey, the Merzi employee I spoke with on Twitter, everything on Merzi's menu is gluten-free, save for the samosas and naan. 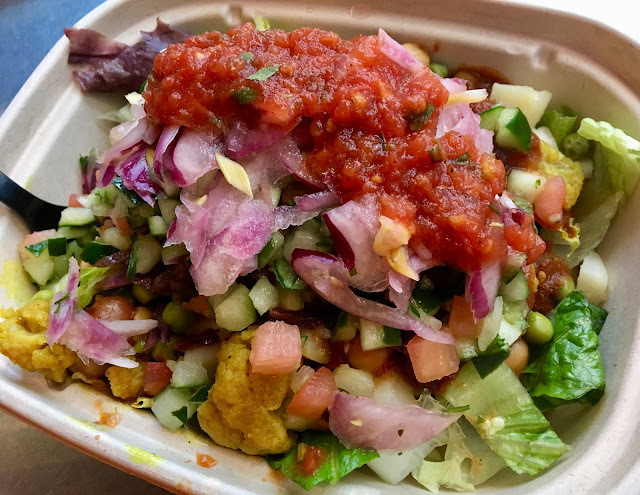 Vegan and dairy-free options are in abundance as well, including hard-to-find dairy-free options like tikka masala and mango lassi. Meals are prepared in an assembly line-like way, and gluten-free diners can choose between rice, salad, and a veggie medley base to build their bowl. When I approached the counter to order, I let the staff know I had a gluten allergy and the person serving me happily changed their gloves and followed my bowl down the line to make sure it was kept gluten and dairy-free. I decided to go for a salad, and piled on the vegan and gluten-free warm veggie options: curry cauliflower, chickpeas, potatoes, peas, and cabbage. I decided to go meatless that night, so skipped the meat options, and chose the spicy onion-tomato masala as my sauce. Finishing it off, I added a tomato and cucumber blend, pickled onions, red chili chutney. For a completely vegan meal, the resulting bowl was fresh, flavorful, and colorful, which many meals- meatless or not- fail to be. I loved the warm veggies, especially the curry cauliflower, and enjoyed the myriad of flavors that presented themselves in each bite. Although I chose a decidedly spicy sauce and chutney, neither were especially heated (but I have a high heat tolerance). My one complaint was that the juices from the food and sauces made the bottom of the bowl a little soupy, but next time I will just order rice instead of lettuce so it can soak up all the flavorful liquid. I cannot believe I let myself walk by Merzi so many times without stopping by to investigate their gluten-free options. It just goes to show that sometimes the best discoveries are right in front of your nose! The good news is that once discovered, I can look forward to many more meals at Merzi going forward- I especially need to go back for their vegan mango lassi once it starts to warm up! If you are looking for gluten-free, dairy-free, or vegan eats near the National Mall, Merzi is a good fast-casual bet for food that is filling and healthy (and won't break the bank). The National Archives, National Portrait Gallery, and National Gallery of Art are all within a pretty convenient walking distance!